Looking at the historical context of the way things used to be measured gives us an understanding of some of the language still used today. We want pupils to imagine that they lived hundreds of years ago and that they need to do some measuring. We have left some squares blank for pupils to put in other ways of measuring. Like many of our activities this one is designed to encourage children to research and produce further examples of tasks and more methods of measuring. Learning Outcomes: Pupils will have gained an understanding of the different ways in which things can be measured. 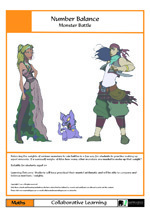 We have devised this activity to help students engage with English Medieval History. 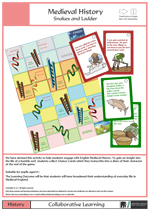 To gain an insight into the life of a humble serf, students collect Chance Cards which they transcribe into a diary of their character at the end of the game.Learning Outcomes: Pupils will have broadened their understanding of everyday life in Medieval England. 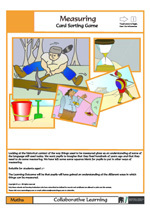 The aim of this activity is to allow students to understand the recurring theme of migration throughout human history. By focusing on the reasons for migration students will develop a greater understanding of the particular circumstances of refugees. 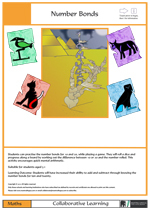 If you have found other reasons or personal histories you can adapt these games to include them. 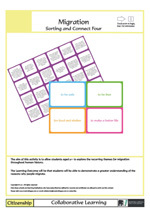 Learning Outcomes: Students will be able to demonstrate a greater understanding of the reasons why people migrate.If you are a subscriber of the Collaborative Learning library (£110 membership with a FREE PENpal with labels and software) then you can download the pdf free of charge and print out. But frankly it is cheaper to buy the pack: all prints are made on cards, cards are sound enabled for PENpal adding an extra dimension of narration, in English and other languages, to the activity. All pictures are illustrated by artists. Game boards are laminated, Playing cards are perforated to give a square edge.The whole package not only looks highly professional, but will last much longer. Every component are stored in an accompanying sealable plastic bag.Each activity can be in other languages using shared audio files for PENpal. So, a Polish teacher or Polish speaking Buddy or a Polish EAL co-ordinator can translate key words and rules in Polish and upload their version for others to share with the FREE ShareLINK software that comes with PENpal. If you have bought the activity then you can also play in in Polish or any other language. Click here to find out more about ShareLINK. Pupils need practice learning the value of numbers up to 100 and in this activity they have the fun of playing connect four while remembering if a number is more or less than another. Playing will also help develop the pupils vocabulary and their ability to work collaboratively.Learning Outcomes: Pupils will be able to identify a number is more or less than another number as well as improve their vocabulary. This game has been designed to encourage the rapid recall of addition and subtraction in units of 2, 5 and 10 in numbers up to 100, as well as encouraging the language development for “more than” and “less than”. For example 10 more than 10 is 20.Learning Outcomes: Pupils will be able to express which numbers are more than or less than a given number. They will also increase their mental math skills. For this game we have taken a variety of musical instruments from various cultures around the world. 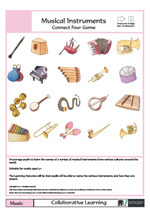 If you wish to use other instruments you will add and replace cards. If you add a different set of musical instruments send them to the address below so we can add them to our library. Learning Outcomes: Pupils will be able to name the various instruments and how they can also research where the instruments come from. 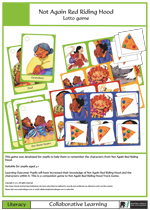 This game was developed for pupils to help them to remember the characters from Not Again Red Riding Hood. This book helps pupils learn counting backwards 10 down to 1. Learning Outcomes: Pupils will have increased their knowledge of Not Again Red Riding Hood and the characters within it. This is a companion game to Not Again Red Riding Hood (Track game). 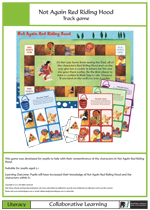 This track game has been devised to encourage pupils to explore the themes, characters and plot in relation to the ‘Not Again Red Riding Hood’ book. The activities reinforce the learning of core words from the story. Learning Outcomes: Pupils will have increased their knowledge of Not Again Red Riding Hood and the characters within it. The book helps pupils learn counting backwards from 10 down to 1. Balancing the weights of various monsters to win battles is a fun way for students to practise making up equal amounts. If a werewolf weighs 18 kilos how many other monsters are needed to make up that weight?Learning Outcomes: Pupils will have practised their mental arithmetic and will be able to compare and balance numbers / weights. 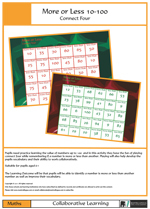 Students can practise the number bonds for 10 and 20, while playing a game. They will roll a dice and progress along a board by working out the difference between 10 or 20 and the number rolled. 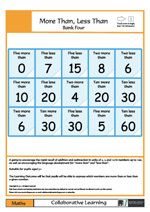 This activity encourages quick mental arithmetic. Learning Outcomes: Students will have increased their ability to add numbers together quickly through recognising the number bonds for 10 and 20.